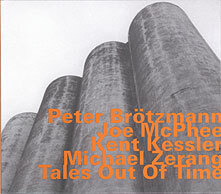 Peter Brötzmann, alto saxophone, tenor saxophone; Joe McPhee, tenor saxophone, pocket cornet, trumpet; Kent Kessler, bass; Michael Zerang, drums, percussion. Recorded on 19 June 2002 at AirWave Studios, Chicago. Cover photograph (reproduced above) by Peter Brötzmann; graphic concept by fuhrer vienna.